As the Toronto International Film Festival celebrated its 40th anniversary, festivalgoers, vacationers and locals flocked to premieres and screenings. They also dined in high-end restaurants, tested out leisure time activities and visited tourist sites. View of downtown Toronto from Lake Ontario. Bonjour. If Bugsy Malone owned a Toronto speakeasy, it would have the same black, gray and white décor of the French bar/restaurant East Thirty-Six. The 1920/40s-looking New York-style bar, with a hint of the South of France, looks like it should be selling bootleg liquor. Makes sense, as co-owner Sebastian Moya hails from Cannes, France and he loves the prohibition era. The philosophy of this establishment is that patrons should drink unique bespoke cocktails, share plates of food and converse. Take a sip of the house specialty, the E36 Smoked Boulevardier (a barrel-aged cocktail with Makers Mark® bourbon, Aperol, Lillet Rouge and smoked tincture). Then don't pick just one appetizer, try two: Pork Caillettes are round sausages, filled with pork shoulder, pork liver and pork heart, served on toast. Bone Marrow is a beef shin bone, you scoop the marrow out and place it on toast with chicken liver parfait. Order the Short Rib for dinner and you get rectangle pieces of tender beef served on a mountain of soy truffle dumplings, Anaheim chili, shitake mushrooms and cilantro. If your taste buds can handle more, dig into dessert: Peaches & Cream is a halved, caramelized peach with lavender Anglaise, Rosewood Estates honeycomb and almond crumble. Even more interesting is the Lemon Custard, served in a small bowl with cubed triangle shortbread and macadamia nuts, which gives your tongue different textures to explore. Hola. Los Colibrís (The hummingbirds; @loscolibris220) will likely be the most upscale Mexican restaurant you will ever dine in. Credit Executive Chef Elia Herrera, who brings her home cooking from Vera Cruz, Mexico and serves it in a tony room with white linen service. Oil paintings adorn the walls and epitomize class and style. Begin the evening with Queso Fundido, crumbled bits of chorizo sausage floating in a saucer of melted cheese; dip a spoon into the concoction and put it on hand-made, paper-thin corn tortillas. The 'Alegria' entrée is "pollo a la plancha," a seared ultra-moist chicken breast with mushrooms, kale, passion fruit and coriander sauce. Sit back. Savor the moment then end the evening with: Tres Leches (moist cake, soursop sorbet, pineapple chip, hibiscus, cocada) or Buñuelos (hazelnut pecan rum-cake, peanuts, guava and dulce de leche ice creams). You will never taste Mexican food this good again, until you comeback. Ciao. In-between screenings, Toca, a handcrafted Italian cuisine restaurant on the mezzanine level of the Ritz-Carlton, is the perfect place for dinner. Chef Oliver Glowig, one of Rome's most celebrated culinary leaders, designed the menu and the staff supplies the world-class service. This is a perfect place for a "special occasion," you can pop open a bottle of Moët & Chandon as you sample the Caprese appetizer (Nova Scotia lobster, buffalo mozzarella, braised tomato). Ravioli Caprese (stuffed with caciotta cheese, marjoram and tomato sauce) is the perfect pasta course. Choose between the Costoletta Di Manzo (succulent dry-aged ribeye) and the Tempura Triglia (tempura red mullet, squid, marinated vegetable, saffron aioli) entrées, depending on your preference for meat or fish. The Tortino Al Pistachio (pistachio olive oil cake, summer berries, pistachio gelato) finishes off the meal perfectly. Don't be shocked if the waiters are extraordinarily attentive. It's normal. Konnichiwa. Put lunch at the very unique restaurant Momofuku Daishō on your itinerary. Perched on the third floor of Momofuku Toronto, next to the very chic Shangri-La Hotel on expansive University Avenue, the street view is worth the visit alone and the food is Asian-inspired. Loosen yourself up with a cocktail like the Big G+T (green apple, gin, tonic or High Seas - rum, orange, pineapple, lemon). Now that you're feeling brave, try a small plate of the delectable Crispy Chicken Buns (with pickled carrot, ssäm sauce, scallions). One of the house mainstays is ssäm, which means wrap in Korean. The Secreto Ssäm (sour cherries, mustard mayo, bibb lettuce) is great with a side order of Cauliflower Bhaji (fried cauliflower- with lime pickle, green chili vinegar, cilantro). You'll be seduced by the desserts: Shortcake (with Ontario berries, goat yogurt, banyuls vinegar) or Buttermilk Panna Cotta (with peach, blueberry, oats). Hello. Walking into the ultra luxury Shore Club restaurant is like stepping onto the world's most swank yacht. Deep rich wood lines the walls; art is everywhere. The clientele is stylish; the wait staff is so professional you'd think they were serving the president. The restaurant is known for its seafood and steak. But for argument's sake, let's just imagine you're in a fish state of mind. The Vanilla-Battered Prawns with spicy sweet and sour sauce are as enticing as the potpourri of fish that is featured in the Fresh Seafood Tower (lobster, crab, scallops, shrimp, calamari). Depending on the night, the fresh fish of the day can be Red Snapper Filet, which you can have broiled or pan seared. Or try the upgraded comfort food, delectable Lobster & Risotto, an occasional special. Both dishes are even better with a side of Sautéed Baby Beets. Finish off the evening with Baked Alaska, which is torched in front of your eyes. After your meal you'll feel like you're stepping off an ocean liner, back on dry land. Everyone can see Lake Ontario when they're in Toronto. Few ever sail on it. Those that do know that the best view of the city is from the water, and the fun way to do that is by sailing around the Toronto Islands. Gone Sailing Adventures caters to tourists, students of the sport and partygoers looking for a private and intimate (only 12 passengers) chartered yacht and a cool place to socialize. Howie Colt is the owner/skipper/sailor of three different sailboats that are moored at the foot of Lower Spadina Ave., next to the Spadina Wave Deck. Guests for his tours put their shoes in a bag and walk onboard barefoot. As he motors off and then sets sail, the view of downtown Toronto with CN Tower and the Rogers Center (home field of the Toronto Blue Jays) is spectacular. As you head out into the lake, you pass by Billy Bishop airport and small planes seem to glide inches above your head. Once on the lake there is a great opportunity to sunbathe, steer the boat and sit in a chair lift that extends out on the starboard side so you can swing above the water, or dip in. During summer months, bring a bathing suit and the yacht will stop so you can take a refreshing swim. The normal trips last around three hours. Private charters can be scheduled too. 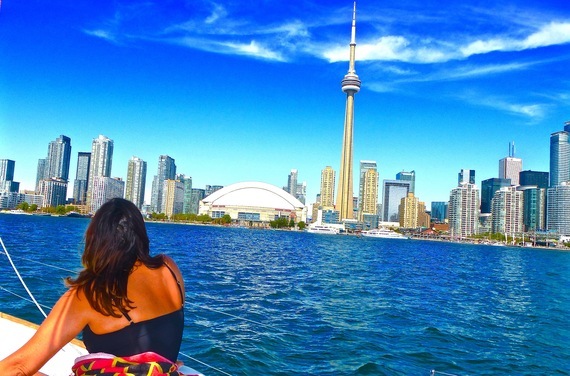 If you want bragging rights while you're in Toronto, tell people you went boating on Lake Ontario and watch them get sailing envy. Indoor Skydiving. If skydiving is on your bucket list, but you're not quite ready for it, try this in-between step. iFLY Toronto is in the town of Oakville in outer Toronto, 30 minutes from downtown. The facility looks like one of those zero gravity chambers astronauts train in, only it recirculates air so people can float and have the sensation of skydiving. One of the iFLY's instructors, Ryan Nichols, notes that the sensation is like flying gymnastics. "We start with the basics first: 1. Learn how to be calm and relaxed with stable positioning. 2. Learn how to fly with others. 3. Learn how to do advanced maneuvers, 'transitions", going from one position to the next." iFLY Toronto has had participants from ages 4 to 97. If you've never done it before, the first trip takes about two hours. This covers check-in time, a brief training session, flight time and an opportunity to look at your photos and video. It's a safe and unique adventure, fully supervised by certified instructors. Once you've done it, don't be surprised if your next quest is leaping from a plane--with a parachute off course. Fish Tales. Next to CN Tower and the Rogers Centre is a family destination that is fun for everyone. It's Ripley's Aquarium of Canada. The indoor site is open 365 days a year and showcases 16,000 aquatic saltwater and freshwater animals. It's the largest of its kind in North America and it gives the phrase "Gone Fishing" a whole new meaning with its glassed tunnels with 5.7 million liters of water and over 100 interactive opportunities. Sharks and other fish swim over you and on both sides. If you and the kids are fans of the film franchise Night at the Museum, you can spend a night at Ripley's and experience that vibe. Their Overnight Reef Adventure is a slumber party that includes hands-on educational experiences and an opportunity to doze off in sleeping bags in the "Dangerous Lagoon" shark tunnel. A late night snack and morning continental breakfast are included in the 8PM - 9AM overnighter. Sports Junkies. If you can't get a ticket to see the Blue Jays play baseball, or the Toronto Maple Leafs hockey team scoring a goal, or the Toronto Raptors dunk a basketball or Serena or Novak Djokovic hitting an ace at Roger's Cup Toronto Tennis Open, join sports fans of all persuasions as they gather at the Real Sports Bar & Grill. Watch your favorite team or player try for another win on a two-story 39-foot HD Big Screen or 199 HD TVs. There are hundreds of fans staked out in the 25,000 square foot, cavernous bar/restaurant cheering for a victory. Whether your team wins or loses will be inconsequential if you self-medicate on one of the 40 beer selections from over 126 draught taps. The tastiest item on the menu is the Fish Tacos (flour tortillas with crispy haddock, Napa slaw, pickled red onions, avocado cream and roasted Jalapeno aioli). There are many hotels in downtown Toronto, but one has the best burger in town, which is served in its atrium-looking Azure Restaurant & Bar. That's the InterContinental Toronto Centre. The burgers are juicy, piled with tomatoes, onions, mushrooms and bacon. The hotel is conveniently located within walking distance to the theater district and is next door to CN Tower, Rogers Center and Ripley's. Toss in a spa, an indoor pool and views of Lake Ontario and the hotel is an oasis in the city. Dining in Toronto is an adventure with international flair. Sightseeing in Toronto is just as rewarding. And doing both while attending the Toronto International Film Festival is magic. Visit travel writer Dwight Brown at www.DwightBrownInk.com.